The menu at your restaurant serves up delectable dishes to diners, but do the wait staff and kitchen crew at your establishment look as delightful as the food? Uniformed workers lend your company a touch of professionalism. 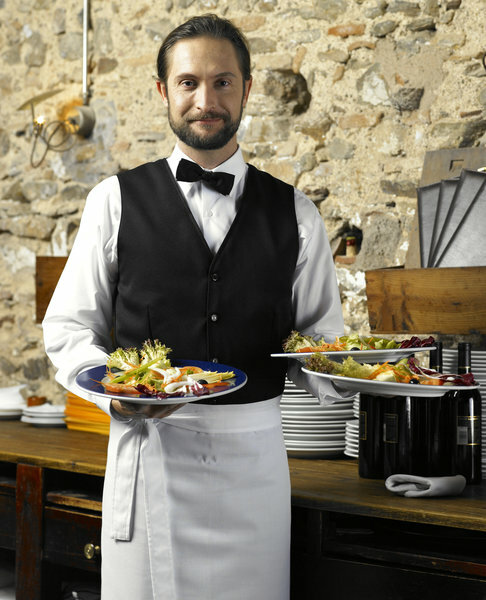 Lord Baltimore Uniform will supply your restaurant with uniform rentals that will leave your workers looking as palatable as your most popular platter. Food service uniform rentals can make your restaurant stand out from the crowd. As a restaurant owner, you have enough on your plate, and dealing with outfitting your employees is just one more complication on your long list of responsibilities. At Lord Baltimore Uniform, our goal is to simplify matters through our convenient, reliable uniform rental service. We supply chef coats, pants, & hats; butcher frocks; cook shirts & pants; aprons; dish towels & bar mops; pocketless & snap garments; and much more. At Your Service: Each week, we will collect your dirty garments, count, launder and itemize them to guarantee that the proper number of uniforms is returned to you the following week. Altered Plans: Should your uniforms require alterations, repairs, or replacements, Lord Baltimore Uniform will issue these services at no additional cost. Label It: Lord Baltimore Uniform heat-seal identification labels into all of your company’s garments so that we can easily keep track of them and maintain a record of employees’ names, sizes, and dates of uniform issuance. For a modest, flat rate weekly fee, Lord Baltimore Uniform will supply custom uniforms to your restaurant and keep them clean so that you don’t have to worry about doing it yourself – or count on your employees to do so for you. We will measure and outfit each and every one of your workers, so you don’t have to worry about sizing or collecting sizes. Whether you own a pizzeria or fine dining establishment, Lord Baltimore Uniform can satisfy your needs with a level of service unmatched in the uniform industry. To learn more about how Food Service Uniform Rentals can make your business more effective and economical, please contact Joe Bateman at Lord Baltimore by calling 800-292-1224 or visit LordBaltimoreUniform.com. We also handle towel rental for gyms and salons; apron, towels, uniforms and mats for restaurants; and uniform, shop towel, fender cover and mat rental for manufacturing and automotive industries. This entry was posted on Friday, October 28th, 2016	at 9:04 am	. You can follow any responses to this entry through the RSS 2.0	feed. Both comments and pings are currently closed.